Your pooch is flying high and dry with this lightweight dog rain jacket! 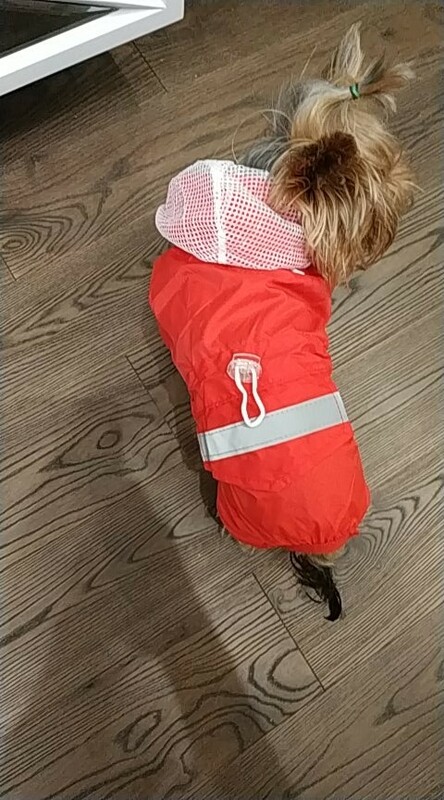 This coat's outer waterproof material is coupled with breathable mesh for your pup's comfort, along with reflective material to keep your dog visible in the downpour. 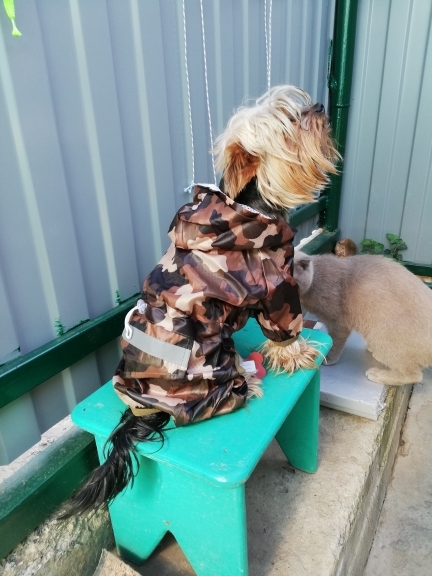 The coat also offers elastic-capped leg bands for additional coverage, an outer D-ring for quick leash attachments, and a flap that can be opened in the back for your pup's tail to poke through! 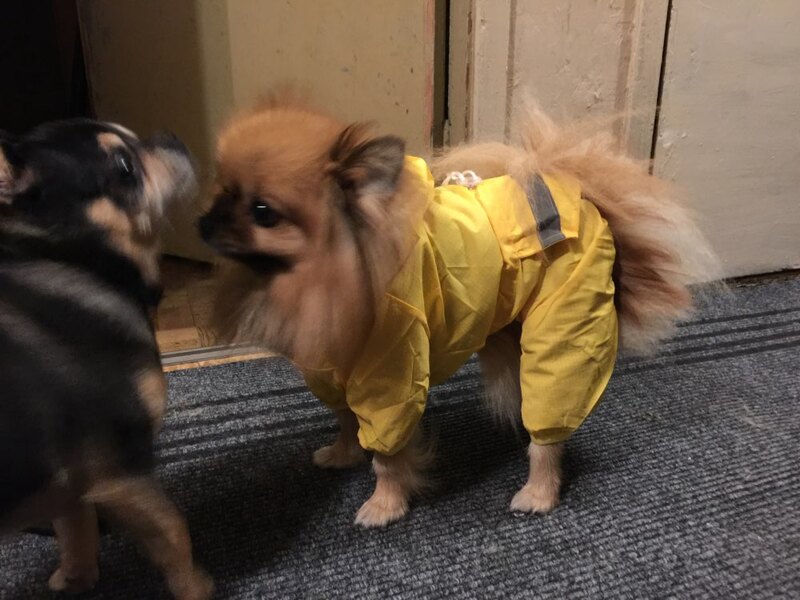 Your pooch will never have to get wet again! 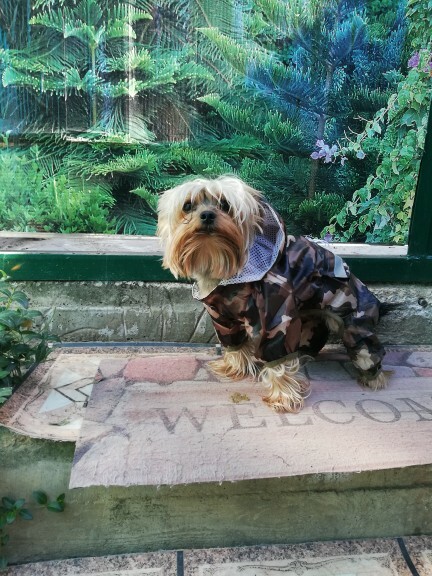 This rain jacket comes in several sizes from XS to XXL, as well as several colors - blue, red, yellow, and camo! Make sure to measure carefully using the guide below. Velcro strap vs. snaps? "Fly & Dry" Waterproof Dog Rain Jacket. 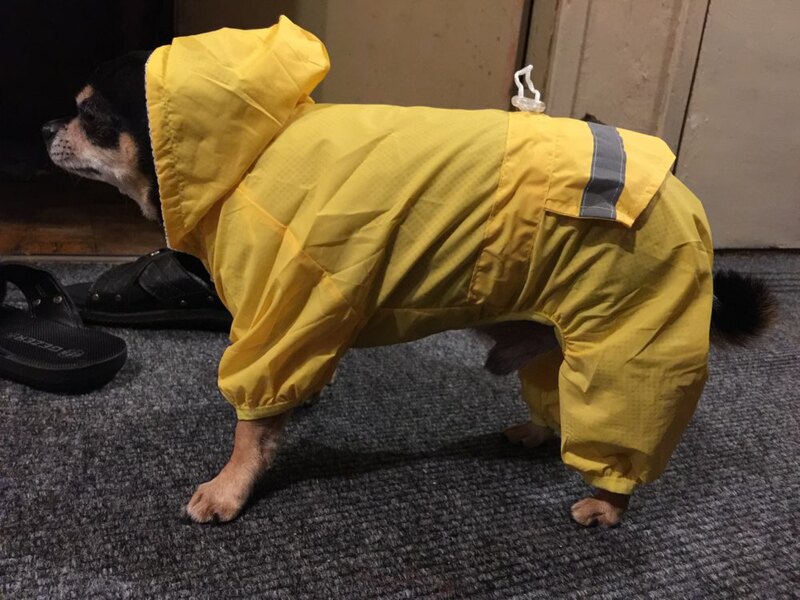 Do you have this similar raincoat but with velcro straps for the belly instead of snaps? I'm sorry, we only have this jacket available with snaps at the moment. 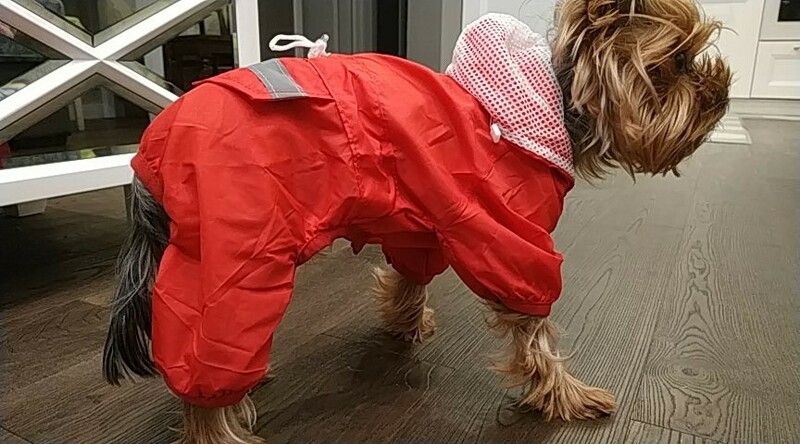 The Drizzle Dog is another canine rain jacket that uses velcro instead of snaps, that might be another option to consider. I ordered a medium for my 30lb Lagotto, this won't even fit my friends Yorkie! I wish the bag would have come with return info! I'm stuck with it for now! However, it is a well made item. Hi Jody - sorry to hear you had sizing issues. This is why we really encourage owners to measure their dogs before ordering, as some of these jackets are more tailored to small dogs. If you look on the product page, you'll see that the Medium is designed to fit dogs with a length of 10.5 inches - it's no surprise that it didn't fit your 30lb dog! 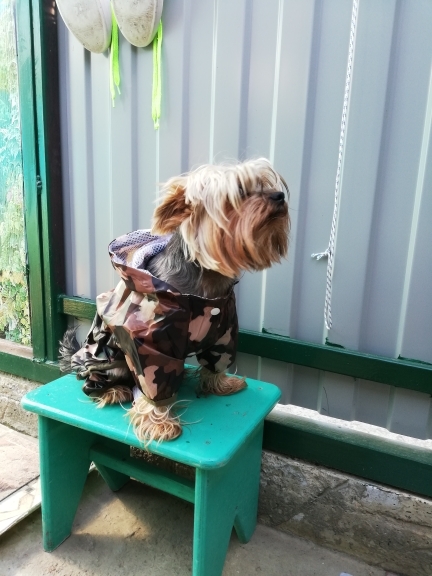 If you'd like to measure your dog and select an appropriate size according to the measurement details we've provided in the product page, we'd be happy to send you a new jacket. Just reach out to us at info@thinkofthefloofs.com. Also, we'd be happy to provide you with a return slip, just email us. Our email info is also provided in the order emails you've been receiving. Ordered S for my Yorkie 2.4 kg. Fit like a glove, good. Excellent quality jackets. Size M was good for my Yorkie. Sewn neatly. 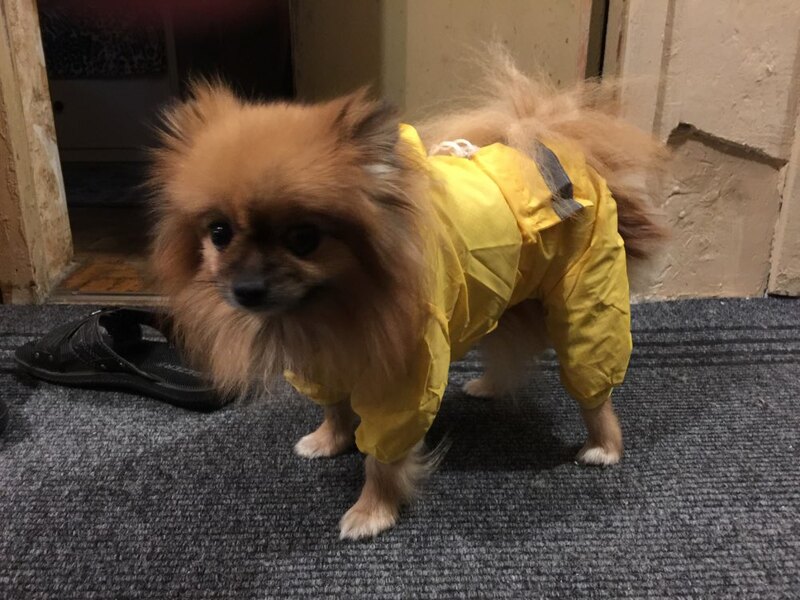 Ordered S for my dog who is 1,7 kg.